It is Wednesday the 2nd December 1981. Temperatures in the UK were about to fall to a teeth-chattering -25C. Queen and David Bowie were at the top of the charts with their mega hit Under Pressure; Charles and Diana were in the first few months of wedded bliss; and somewhere in the USA John McEnroe was having a Horlicks and still trying to calm down from his “You canNOT be serious” rampage six months’ earlier. Meanwhile, in a solicitors’ office in Sale, Cheshire, my mum (aged 24) had just passed around a box of Quality Street that had been sent in by a client. 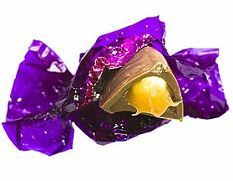 Everyone reached in for their favourite sweet, the green triangle, gold penny and then, The Purple One. 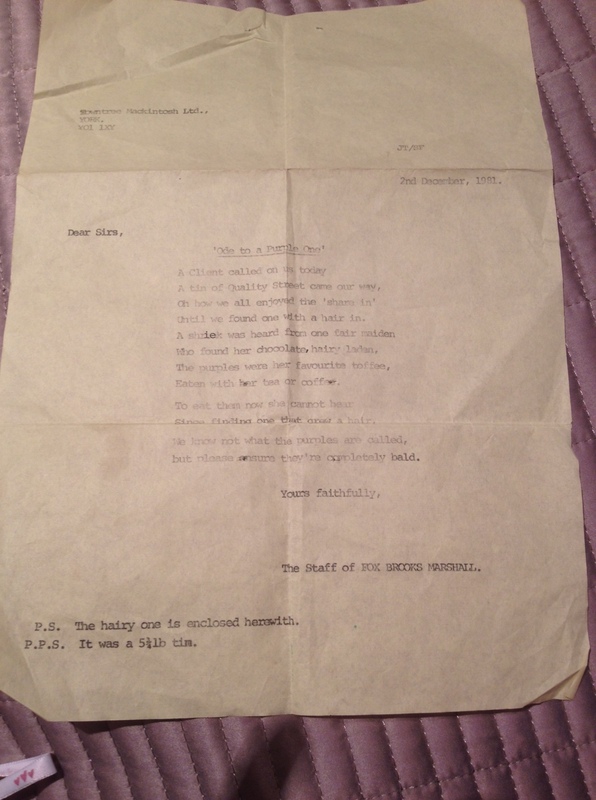 What happened next led to the following letter of complaint that my mum sent to Rowntrees on 2nd December 1981. There aren’t enough words that can do this justice so I won’t bother. Here it is in all its glory. Until we found one with a hair in. Who found her chocolate hairy laden. Eaten with her tea or coffee. Since finding one that grew a hair. But please ensure they’re completely bald. P.P.S. It was a 5 3/4 lb tin. 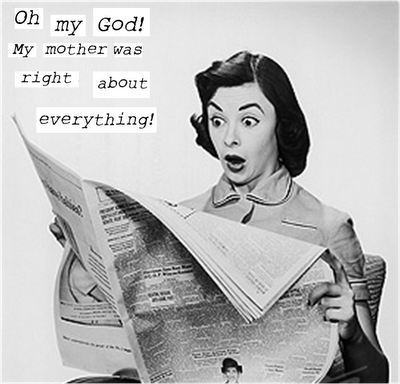 I am especially proud of the use of a correct reference – Mum was and is the best legal secretary in the West. I am also delighted with the cheeky nod to the weight of the tin, a polite yet obvious suggestion for possible compensation. Bravo Mamma! Unfortunately, for all her troubles, charm, and pzazz, all my mum received from Rowntrees was a £2.00 voucher for some Quality Street without even a nod to her originality and flair. Think it is pretty safe to assume that we Foxes like a complaint now and again! So proud of my mum – what a legend! 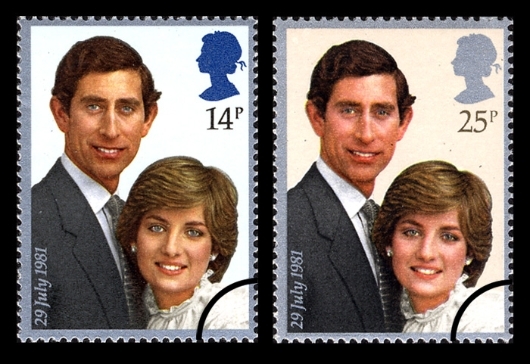 I think she’d kill me if I put a pic up so here is a Charles and Di commemorative stamp. Haha you’re mom sounds like a woman who’s not afraid to speak her mind. Brava mama! Thanks Zari! She is incredibly proud of herself for this – don’t think I’ll ever live it down! Talk about sharing genes 😉 Such a cool post! I like the “Dear Sirs, Ode to a purple one”. Magnificent! And nothing like typewriter letters. Perfection is so much more perfect when the creative tool is as analog and personal as a typewriter. Thanks Andre! My mum is loving the notoriety she is getting from this.